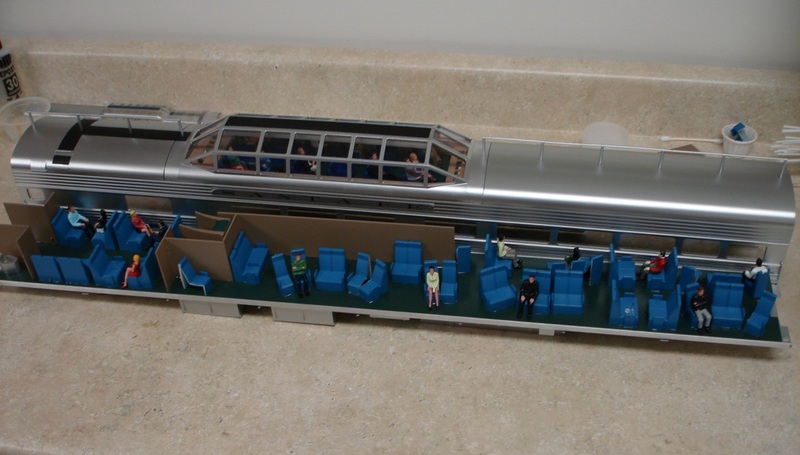 USA Trains makes a very prototypical extruded aluminum passenger car in 1:29 scale. I have detailed a twelve car set of these to use for the Santa Fe Super Chief consist, as well as made three Santa Fe business cars. With a few extra details, these cars can stand out. The first thing I do to these cars is to add Kadee 830 body mount couplers. 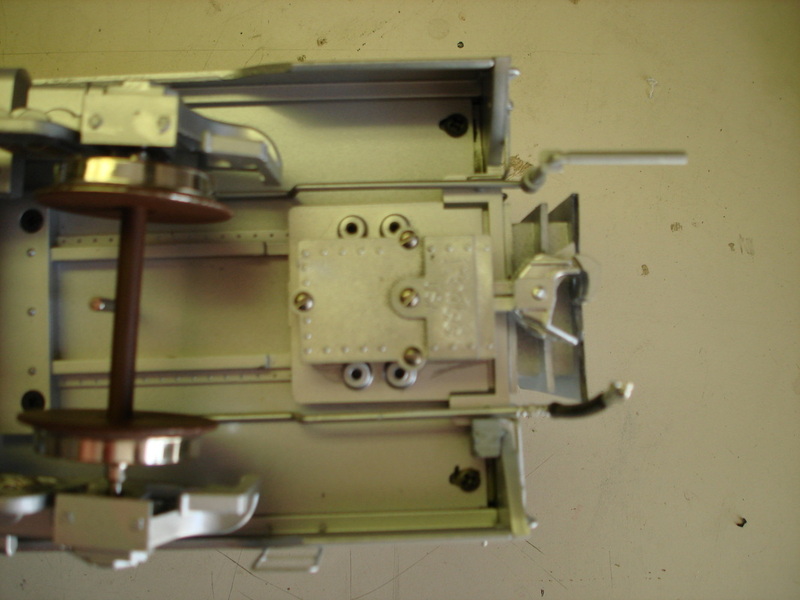 (Kadee has since released the 906 which is a more prototypical looking coupler with the same box) After removing the factory coupler, there are two braces that the Kadee 830 can sit on. I position the coupler so that two cars will close couple. Note: In order to close couple the cars, make sure your curves are broad enough so that the cars won't derail on turns. I keep the factory steam line and add air hoses. 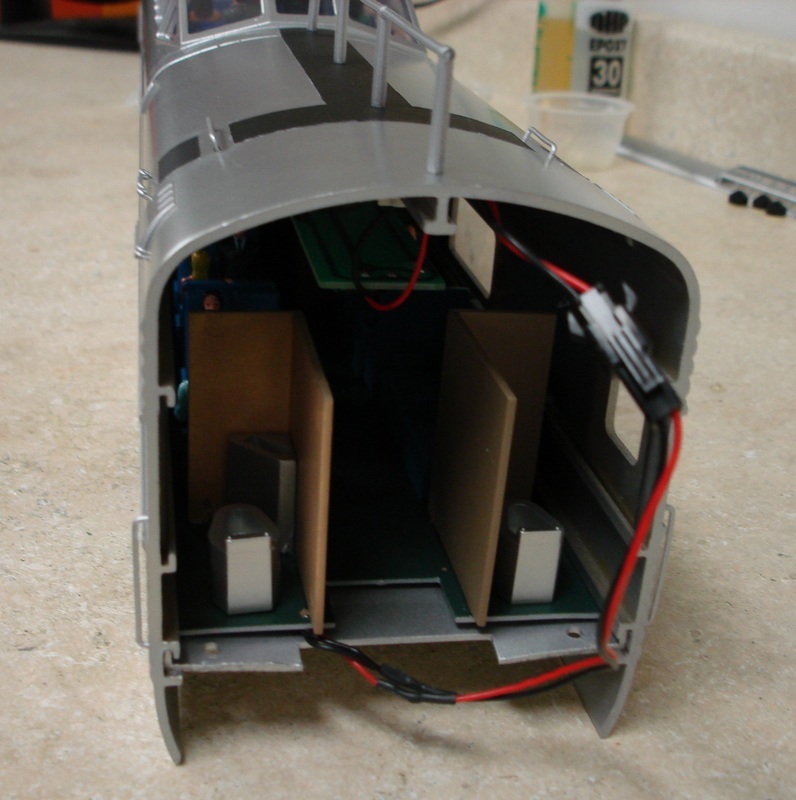 Kadee 830 body mounted to USAT passenger car. 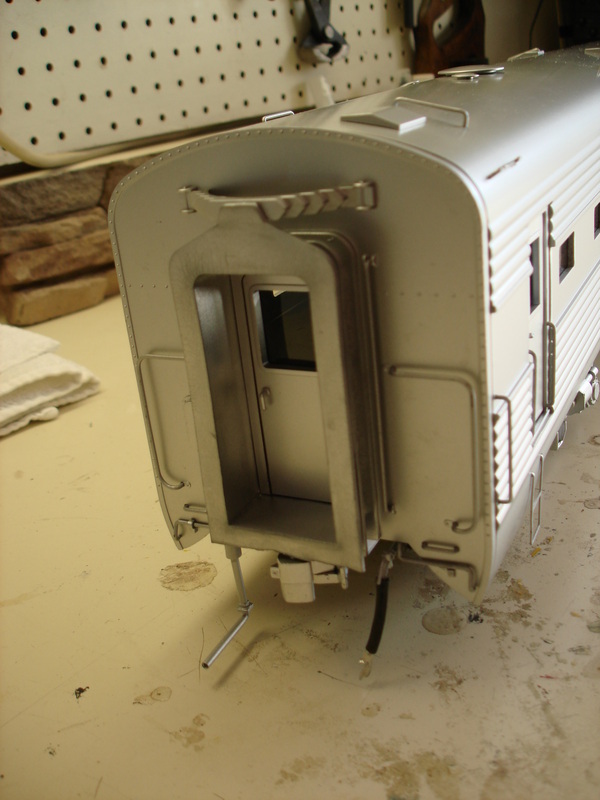 Next, I painted the diaphragms silver to match the prototype. Then, I painted the wheels rust brown. The knuckle of the coupler is just beyond the front of the diaphragm which allows for close coupling. The treads of the wheels were covered during the painting process. Now for the hard part, disassembly in order to detail the interior. Remove the screws at the ends of the cars and remove the end by gently rocking back and forth. 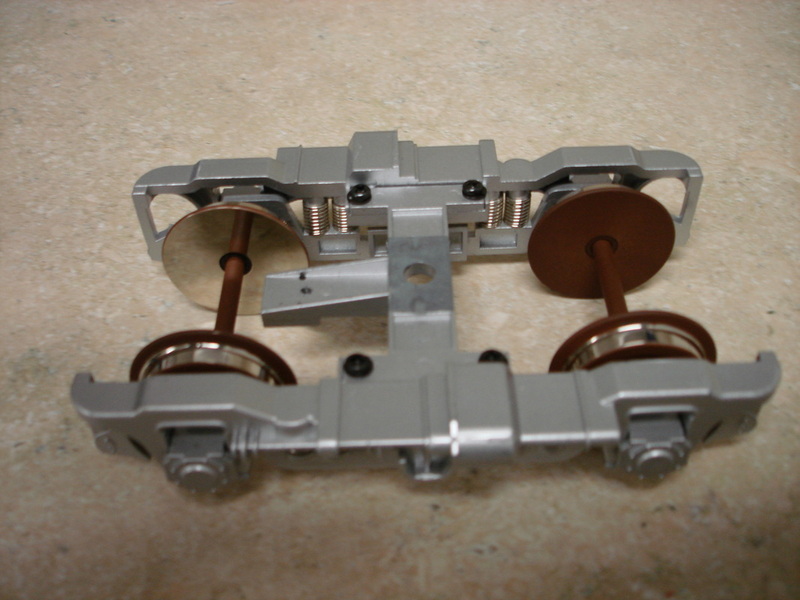 The top is attached to the body by a T groove. 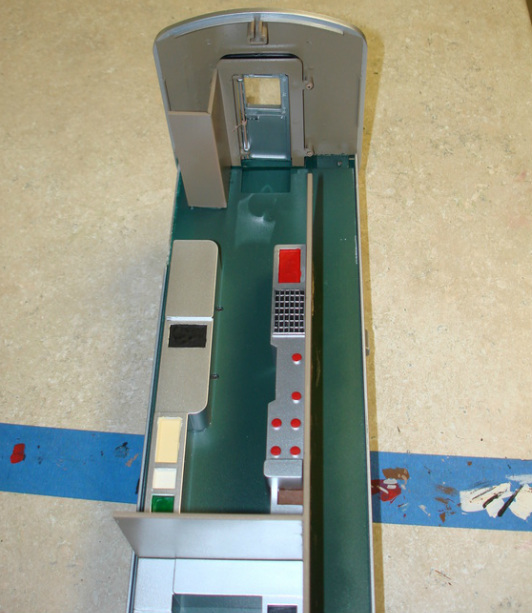 For the vestibule end, the same process is used. Be careful to not pull too hard since these sections of the car are plastic. Remove the window glass by sliding them out of the car body. Also, slide the lighting strip out of the car after disconnecting the circuit board. There is a connector clip on one side of the car. Remove the trucks from the car. End of car removed showing lighting strip connector and place to slide the window glass out. The T-groove that holds the ends of the cars on also supports the light strip. 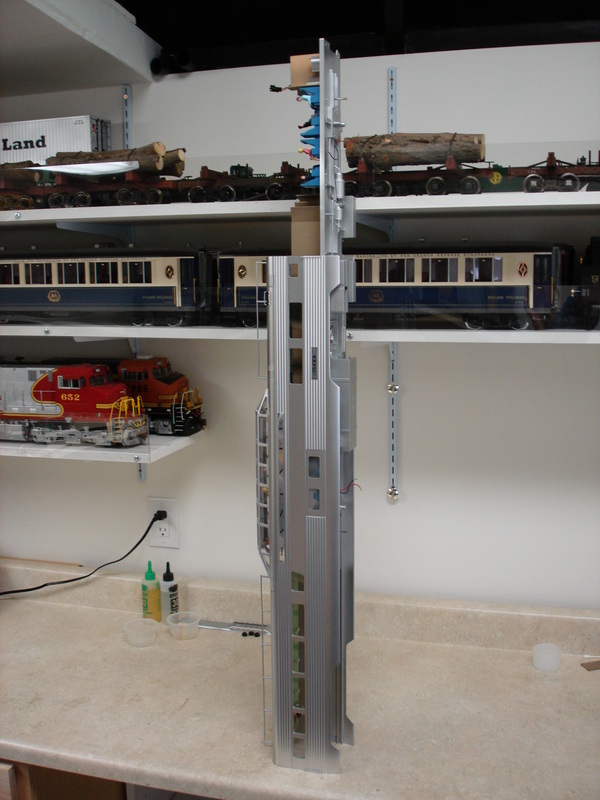 I have disassembled 15 cars and contacted USA Trains to see if there is a better method, but there isn't (USA Trains has a special hydraulic tool to remove floor). I stand the car up on end on a firm workbench. Then, using a rubber mallet, I hammer out the floor. I put a piece of scrap wood between the floor and the rubber mallet to prevent the floor from bending. It sounds crazy, but it works. Two people help - one holding the car and one hammering. Be sure the trucks are removed before attempting this procedure, otherwise the floor will not come out. Typically, I lose a few pieces in the interior that fall out due to the vibration, but that doesn't really matter since you will be detailing the interior. The floor of the car holds a thin sheet of aluminum that all the interior is glued down to. This is why it is difficult to get the frame in or out. I had to hammer the frame about half way and then two people can slide it out manually. Process of how to remove or install floors into USA Trains aluminum passenger cars. After you paint and detail the car, manually slide it back in as far as it will go. Then, unfortunately, hammer the frame the rest of the way in. It is important that everything is glued down well so nothing falls apart at this stage. To make it a tad easier on myself, I sanded down the sides of the frame and used a bit of WD40. Then, slide the glass and lighting strips back in. Reattach the trucks and the end pieces. And there you have it, one detailed car! Dome 501 with freshly painted interior. 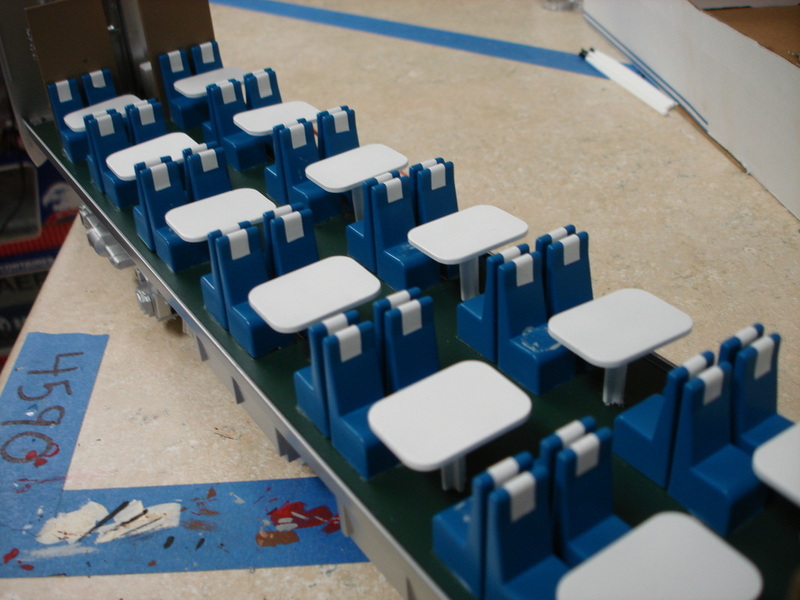 The seating is rearranged to represent the prototype. The black strip on the top of the car represents the anti-skid mat on the prototype. Painted interior of diner 602. Headrests are made from pieces of white tape.